Future-proof Diagnostics Equipment, from a basic user friendly diagnostic system to a specialist vehicle PC Based specific diagnostic system all from within the V-Tech UK portfolio. All V-Tech’s diagnostic machines are ideal for any workshop requiring a hassle free optimum service. These machines are far advanced than most of our competitors, simply because our constant update service is based around our customers’ feedback. Have a problem with diagnosing a specific vehicles makes? Give us a call, we’ll get the problem diagnosed & solved. In the meantime, you can be sure to know that the next update will have that issue resolved! Of course, now this service has been going on for 5 years, so our machines most probably won’t have that diagnosing problem in the first place! 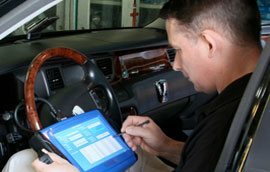 When it comes to automotive diagnostics equipment, you have no reason to buy elsewhere. We have been in the industry for many decades and therefore know what it takes to provide you only Top quality car diagnostic equipment. Having been established over many years, with an excellent reputation to boot, we develop and sell a wide range of systems ranging from the standard to the most advanced PC-based special diagnostic systems. The most important thing about our systems is that they will suit any workshop looking for a simple optimum performance. Our systems developed over many years of raw experience are far more advanced compared to what you may find elsewhere. We take on customer feedback and continually improve our car diagnostic equipment based on that feedback. In order to ensure that our customers say and do, we update our services regularly so as to meet their engine needs. In case you are thinking of diagnosing certain vehicle models, then you have come to the right place. Car Diagnostics Equipment UK is just a phone call away; let us know and we will be most willing to fix your problem. It doesn’t really matter the kind of problem you want us to assist in solving, just be sure that in our subsequent update, you are covered. Our long stay in the field simply means that there is no chance that our machines will let you down.